Observing and understanding people and how they interact with products and services provides a solid foundation for any business. That’s y businesses need to focus on customer experience to set themselves apart from their competitors. To improve customer experience it is important to maintain the healthy relationship with your customers. No doubt that customer experience strategy improves face of the company, which is the first point of contact between customers and companies’ employees. Building a great customer experience has shown to improve customer satisfaction which automatically increase sales and revenue and generate more word of mouth marketing. According to the report of customer experience consulting firm Walker, “by 2020 customer experience will overtake price and product as the key brand differentiator”. 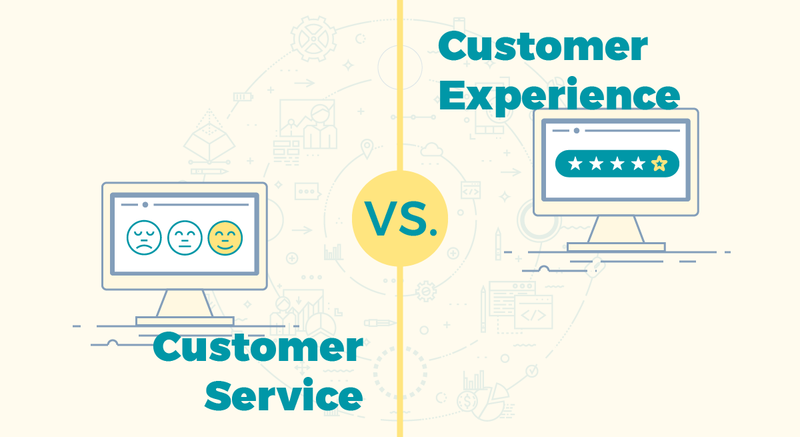 Customer experience refers to the interactions that app or website visitors have with your software, while Customer service refers to the support that organisations provide customers with issues. In much simple terms, we can say that customer service is the way by which company interacting with an employee by call, through live chat or any other medium. However, customer service is only one component of customer experience. So what’s the lesson? Just open up yourself to believe that your business can improve. Even if things are going well, you still need to lookout new ideas to improve customer experience strategy to deliver a great customer experience. The first step of customer experience strategy is to set a clear customer experience vision. You can define visions by creating a set of statements that act as a guidelines. Once these guidelines are in place, they will drive the behaviour of your organization. Every member of your team should know these guidelines by heart and they should be embedded into all areas of training and development. It is important to define your customer persona. Good understanding of your customers helps you to develop a better CX strategy but also leads to earn high revenue. It is better to define exactly the feeling that you want the customer to experience when dealing with your organization. Focus on customer’s touch points – Touch points can be either directly or indirectly with your business. From social media to direct service delivery follow up, you have to gain deep understanding of each individual touch point. Listen to your customers carefully – In one study it is found that 50% of a customer’s experience is based on emotion. Always listen your customer on positive emotion. What they are saying about your company, your products or services and about your brand? Try to find out the answers of these questions. Design customer journey map according to touch points – Touch points build experience and on the basis of that you can design new or restructure customer journey map according to your business. With the help of new journey map you can create unique multichannel customer experience. Because people want to choose your service anywhere, anytime. Note down one thing, always learn from the mistakes and the success of others. Are they offering same product or services? Now let’s go ahead and build a customer experience strategy (CX) that solves what we are trying to achieve in terms of customer experience. Re structure goals to create lasting value through a CX strategy. Identify barriers in reaching objectives. Define how a CX strategy will accomplish objectives. Create brand messaging and voice strategy. Creating a clear roadmap will serve as a strategic document and canvas that outlines the strategies and tactics across customer experience channels. It will automatically drive customer engagement and deliver results for your business. Try to identify customer effort score (CES) which is specifically designed to determine the relative amount of effort required by the customer to connect with your business. Collect data about your customers’ perceptions of your business. Another valuable metric is customer lifetime value (CLV), which measure total worth of a customer over the entire time of that customer’s relationship with the company. Receive customer feedback through email or during live chat with rating view after the session. Pay attention to all the channels and discover where your customer experience currently stands. Create customer journey map to discover how different consumers choose to interact with your brand. Use analytics to find out customer desires. Build customer centric culture by hiring the right people. Once the company understands the value of systematic customer experience strategy, the company must go ahead to implement such strategy through a step by step process. Hope these different ways helps to align and improve customer experience strategy across your organization to deliver world class customer support.